The worldwide, multi-billion dollar, bottle recycling industry performs a vital social and environmental function. This industry not only conserves natural resources but also employs millions of people around the world. PET or Polyethylene Terephthalate is used as a raw material for manufacturing plastic bottles and containers as well as a wide range of other packaged products. Examples include water, soda, alcoholic beverages, detergents, cosmetics, and pharmaceuticals. PET is one of the most popular consumer plastics used in our society today. 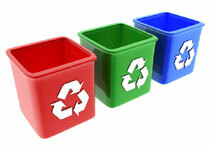 Post-consumer PET or recycled PET is the recycled raw material used in a wide variety of products. To achieve pure PET, the recycled bottles and containers are inspected for any non PET materials like caps, lids, and product labels. These materials are removed, sorted, cleaned, and then processed into flakes. The PET flakes are then crushed into bales and offered for resale. The amount of plastic bottles recycled in the U.S. has grown every year since 1990 and about 2.4 billion pounds of plastic bottles were recycled in 2008. Glass has become one of the more popular recycled materials because of its purity and ease of recycling. Glass containers are manufactured using a variety of readily available materials, such as sand, soda ash, and limestone. The first process for recycling glass starts by creating cullet, which is done by crushing the glass bottles and jars that have been collected. Cullet is the main ingredient in new glass containers. After the cullet is collected and melted in a furnace, it is molded into a variety new desired shapes and sizes. This process is usually pretty quick. Usually under 30 days. New glass bottles are usually manufactured from up to as much as 70% recycled materials and it is estimated that 80% of this recycled glass ends up being new glass available for purchase. Unlike other recyclable material, glass can be recycled over and over without loss of quality. This is important because virgin glass consumes more energy and resources which leads to more pollution.